On Monday March 5th the Budget Advisory Committee was given a presentation on why the City Began getting involved in repairing community mail boxes. Committee Member and Rialto Police Benefit Association President Richard Royce brought this issue to the Committees attention and began the process of fishing out one of many ways the city is wasting taxpayers money. What happened is that these Community Mailboxes have become a haven for criminals over the last few years in a state where you can steal peoples mail and get away with no jail time. So we put everyone’s mail in one location and then decrease the consequences for getting caught it has become a major problem that the post office never foresaw reaching the levels it has today. The interesting thing here is why did the city get involved in doing something that is clearly a post office issue and why they once again feel it necessary to lie about it? What happened was the post office wasn’t moving fast enough for the Mayor and some of her friends here in the city. 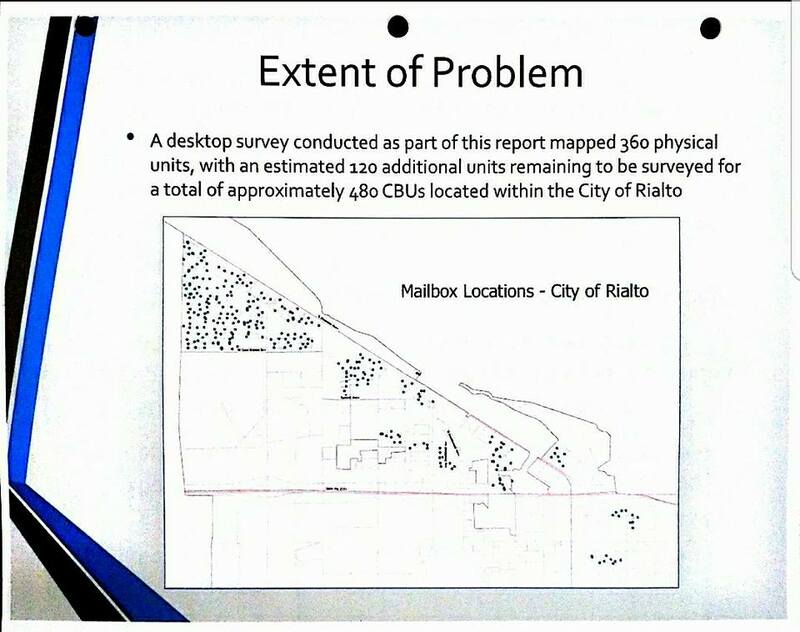 A few group of residents in the Las Colinas area of Rialto didn’t like the answer that the post office had a 6 month wait for Community Mail Box Repair and Replacement. So the mayor directed Public Works staff to purchase and replace these boxes after hours on overtime. What happened next is people talk and then what started as a favor from our Mayor to her friends became a public program that we don’t have the money for. If it wasn’t for RPBA Union President Richard Royce sniffing out this missuse of funds we may have never known that $30k was spent on a program that was not the cities responsibility in the 1st place. Now the Mayor is trying to take a fake victory lap for something she had nothing to do with. The Post Office has ruffly $1.3 million in boxes that will be used to replace damaged boxes. Previous Glimmer of Hope in the Midst of Tragedy Next Are the Friend’s of Rialto K9 Association Another Problem In Rialto’s Finances?